Beginning October 3 and running through December 30, Good Housekeeping is running its first pop-up shop and digital boutique. The space is called GHLab, housed in the Mall of America in Minneapolis, MN. Visitors to the shop will be able to peruse a collection of items tested in the Good Housekeeping Institute’s labs by scientists, chemists, engineers and tech experts. The store, spanning over 2,800 square feet, features different themed rooms that aid shoppers in imaging the items in their own homes. Interactive displays allow shoppers to try out smart-home tech, kitchen appliances, toys and games, beauty and more. 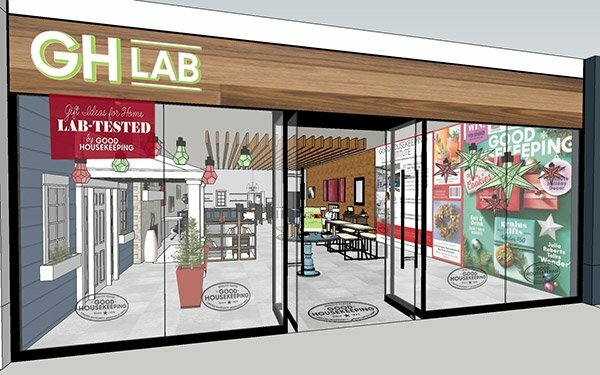 As part of its emphasis on delivering the best products to its customers, the GH Lab will feature only the top-rated product from each category of items. The showroom will be stocked with Good Housekeeping Seal holders, Best-of-the-Test winners and GH Lab picks. Customers can pay for items through Amazone SmileCode technology, which allows for cashless transactions. Purchased products to be delivered directly to customers’ homes. Those customers without smartphones can use tablets offered by sales staff. Good Housekeeping is extending its GH Lab to Amazon’s online marketplace, where customers can shop the same Good Housekeeping-texted products from a dedicated digital boutique.